Ultraviolet is far from my radar and from any of my reading plans. I’ve never read any of R.J. Anderson’s work, and I wasn’t just really that interested even if I’ve read some good reviews for them. I saw the ebook on Netgalley but just looked over it, thinking that it’s not something I would be interested in. I wasn’t sure what to place this in from there. We find our heroine, Alison Jeffries, waking up in a rehabilitation facility, surrounded by people in nurses uniform, with no memory of why and how she got there. Alison is sixteen, confused and worried about her current situation. As her memories start trickling in, she is moved to Pine Hills Psychiatric Treatment Center, where she grapples with the possibility that (1) she’s crazy and (2) she may have just killed her school mate and rival, Tori Beaugrand with her mind, as she can see what color a number is and taste things like lies, things that normal people could not do. Alone and treading the thin line between sanity and not, Alison finds a friend in neuropsychologist, Sebastian Faraday, giving a name for her condition and convincing Alison that she is a normal girl. To reveal more would be spoilery, so I’ll let you find out for yourself. I was aware of a coming twist that would turn Ultraviolet around and I resisted the urge to read ahead just to find out when, where and what it was. It was easy to stick to the story though, because the author’s writing is just so good that I wouldn’t think of skipping any page. The story was tight, and I felt genuine sympathy for Alison as she struggles with her ordeal. I just really wanted to give Alison a hug and believe that she isn’t crazy, you now? At the same time, I was very interested in Alison’s condition — which apparently, is real. And then…things changed. I was expecting it because of the reviews I read, but I wasn’t sure when it would happen. Like what other readers have said, it was done quite seamlessly that I couldn’t question how untrue it was. I’m usually skeptical about how things turned out here, this one worked. I had a hunch about what it was, and it turned out correct, but it wasn’t also 100% right. The author managed to keep the balance between what’s real and not real and make it work, while also giving us readers a way to describe something infinite. Forgive the flowery word, but that was just the only way I could describe it. Infinite. Ah, I’m sorry I can’t reveal that much more because it would destroy the reading experience of anyone who reads this and decides to read Ultraviolet. I was pleasantly surprised by this one, and I’m glad that I gave in to the good review pressure and read it. This is definitely one of those books that will have readers discuss and laugh and share a secret smile about. 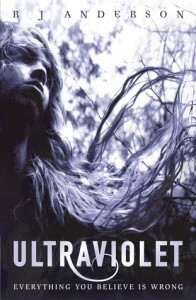 I want to read Ultraviolet SO BAD! It sounds great and like a bit of a mind bender, also Chachic gave it a good review. And so did you! SO it has to be GOOD! Your post has me SO curious about this book! Sounds like there are a couple of good twists in here and … oh I want to know what happens. And I do like the cover. Yay, I’m glad that it looks like you enjoyed reading this as much as I did. It’s so hard to write a spoiler-free review for it, right? I didn’t even want to mention Alison’s condition because I wanted other readers to discover it. There’s a character in Raw Blue who has the synesthesia. On that character in Raw Blue: that’s cool. I really thought it’s a fictional thing. The reviews of this book I’ve come across so far make it sound really intriguing & unusual *Adds to the TBR list!